This portrait was made using four SB-900 Speedlights. 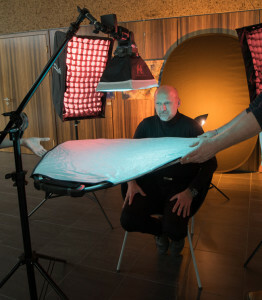 The main light is in a European 8×12 softbox, for which there are many comparable models on the U.S. market. here’s one flash in each 16×16 Westcott Mini Apollo softbox, left and right of the model, and one aimed at the background reflector. The Westcotts are fitted with egg crate grids. “They help prevent light spill by channeling the light more directly at the subject without it contaminating the background color or coming into my lens,” David says. A 30-inch Lastolite TriGrip reflector, with a Softsilver surface, bounces some of the main light’s flash up to the model’s face. It’s easy to tell that gels played a part, too: there’s a cyan gel on the main light, red gels on the Apollo softboxes and an orange gel on the background light. 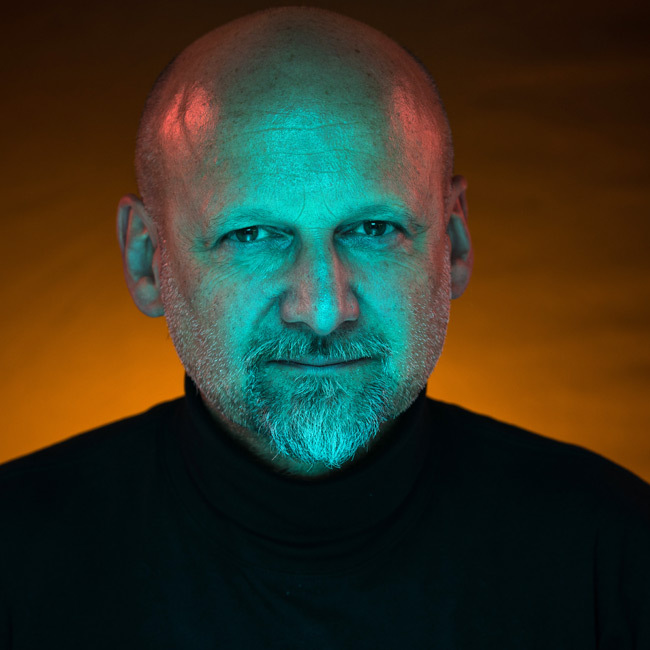 Once again, David used the Creative Lighting System’s group capability—with the main light Group A, sidelights Group B, background light Group C—and exposed the image by independently adjusting the power output of each group from the camera position.